The camera makers have you right where they want you: confused. Each new camera release throws some new variable at you to try to work through in deciding what product to purchase. You’re tempted by some new “great thing” that the marketing department is trumpeting on each new camera, because other systems don’t have any equivalent. Making decisions this way is a bit like trying to pick the hottest stock for the next quarter: short term is a gambler’s folly. I believe that you have to look beyond the short term in picking a camera system. If you’re willing to abandon the gear you’ve bought and start over at any time—maybe as soon as next week or next month or next year—then just stop reading right here and enjoy your merry-go-round of camera gear. For those of you still with me, here’s how I believe you have to think: our logical choices are all about a stop apart (1” to m4/3 to APS to full frame). By that I mean that—all else equal in a photographic sense (angle of view, aperture, position, etc.) and given the same generation of electronics—you’d tend to find about one stop of difference between the different sensor sizes when you evaluate things such as depth of field or dynamic range. Of course, the camera makers don’t all have the same lenses available (different angle of views available), use different generations of sensors, have sensors with different pixel counts, and a host of other variables that get in the way. Indeed, image stabilization is one of those things that sometimes gets in the way of a well-considered decision. Amateurs overvalue image stabilization that is on all the time. Pros don’t. Image stabilization (IS) is a good way to take away a little bit of edge acuity, because IS has a limit to how fast it corrects. Of course, if you’re using a kit lens and shooting JPEGs (compression), maybe you’ll never notice the missing edge acuity. Still, over time these differences tend to equal out in every system. More lenses get introduced. If the camera doesn’t have sensor IS, more lenses with IS get introduced. Sensor generations tend to even up, as do pixel counts. Given that a serious shooter ends up with more investment in lenses than bodies in their bag at any point in time, you can buy a body today and replace it a year or two down the road. Replacing all the lenses you accumulate over time is a lot more problematic. But I’ll bet if we come back a year from now, that list will be shorter and different. I’d say that things really boil down to this: do you want to sacrifice a performance stop (APS) or two (m4/3) or even three (1”) for something else that is gained? In particular, m4/3 (two stop sacrifice) looks pretty compelling to many because you gain significant smaller size and weight advantage (to Sony’s A7 series or the Leica SL), have a very full set of lenses, get access to features not yet present in other systems or just emerging (pixel shift for resolution, 4K video, etc. ), and have solid photographer-centric controls in splash/dustproof bodies. Each of the mirrorless mounts has a slightly different compelling story to offer (e.g. Nikon 1’s still unequaled autofocus performance). But be careful if those things that attract you could turn out to be temporary advantages rather than permanent (again, e.g. Nikon 1’s autofocus performance, which will likely be matched by another mount at some point). But I keep coming back to the two things I mentioned before: depth of field and noise. There are times when I want deep depth of field or highly isolated focus planes (no depth of field). For the former, a smaller sensor is useful, for the latter a larger sensor is useful (again, all else equal). There are times when I’m shooting in Sunny 16, where signal-to-noise isn’t really an issue worth worrying about with any modern sensor, and other times when I’m in very low light, where it is. Even in my DSLR kits I have cameras and lenses that attempt to maximize my abilities with those two things: depth of field and noise. It isn’t out of the question to me that if I were to shoot only mirrorless I might have, say, a m4/3 system and a Sony FE system, which would allow me to do the same. Sure, if you’re looking for a jack-of-all-trades solution with minimal components (a camera body and maybe two lenses), you’re going to compromise on something. Make sure you know what you’re compromising on and whether that’s a short term or long term compromise. Lens sets change over time (short term), sensor size doesn’t (long term). But frankly, there’s not a bad choice in the bunch, only less-optimal-for-your-needs choices versus perfect matches. So rather than debating which system to buy, make a prioritized list of your needs, then find the system that matches those today or is likely to tomorrow. Size and weight. I have a full DSLR set that’s compelling, so first and foremost, mirrorless appeals to me for a potential size and weight reduction on trips where I can’t carry a lot. Optical attributes. Both the range of available focal lengths I can carry as well as the ability to increase or decrease depth of field, as needed. Plus acuity and lack of other optical issues I’d need to correct in post processing. Signal to noise. I don’t shoot a lot of truly low light, but I do manipulate shadow detail a lot, which is where I’ll see this appear. I could go further and add more attributes to my list, but those first three things already start to weed out a lot of possible choices. The Canon EOS M and the Leica SL/T systems tend to fail at #2, for instance, while the Nikon 1 systems have trouble with #3. When I originally chose m4/3 as my “small bag” choice to carry instead of DSLRs, it clearly had #1 and #2 nailed, and the sacrifice I was giving up for #3 was something I could live with. Now that Sony’s FE system is growing in ability, I could probably give up some on #1 for a gain in #3. Is that enough to make me switch? No, because #1 is my highest priority, and #2 my second highest. 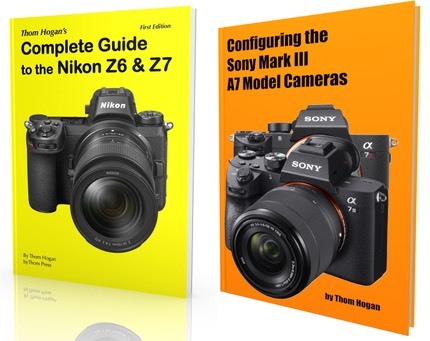 The A7 models are actually growing a bit in size in the Mark II models and the lenses are on the big side despite things like f/4 apertures on the zooms. But those are my priorities, not yours. Unless you can concisely state a few priorities, you’re going to have a difficult time choosing between mirrorless systems. So sit down and make an ordered list of the top five things you need in a camera system. Evaluate how your current system (if any) stacks up, and how your possible choices do. I’ll be you end up with a pretty short list to go to a store and try out.